Workplace stress is a multifactorial phenomenon. The fact that it’s created and complicated by more than one problem means that it’s an increasingly difficult challenge for modern business owners, particularly those in metropolitan areas. It’s insidious by nature, and influences workers on several different levels, so its impact can be felt not just in work environments and quality of life, but on the bottom line of the business. If this situation sounds bleak, you’ll be glad to learn that there’s an upside. Although workplace stress is attributable to a number of influences, there’s a solution that addresses most of them in one go: indoor plants. It might sound counterintuitive, but much of your workers’ stress can be reduced just by making your workplace more attractive. Visual influences are important to the wellbeing and productivity of human beings, who inherently prefer the visual novelty of colourful spaces and perform better in physically comfortable environments. Research in architecture and interior design has found that workplace design is important in attracting and retaining high-performing staff. While there isn’t yet a lot of empirical data on the topic, there is solid support emerging through compelling primary-source research—like Empirica Research’s 2014 study—linking physical workplace environment (office design) to employer attractiveness. Workplace design significantly increases the attractiveness of employers to potential candidates, especially in conjunction with an attractive organisational culture, leading to higher job satisfaction, employee recruitment, and employee retention. 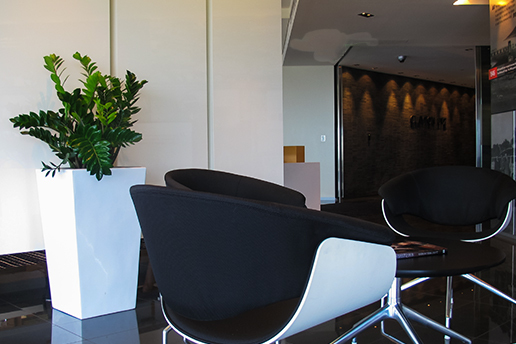 One of the easiest ways to make office spaces attractive is by bringing in some nature. Studies at the Agricultural University of Norway concluded that potted plants reduce stress; and according to other research, workers who spend over four hours a day at a computer feel better when they have plants near their monitors where they can see them. These studies confirm what people know intuitively—that plants create calm, make people feel better, and restore general wellbeing. It’s well documented that noisy environments are harmful to workers. The EPA has documented that excessive noise causes mental fatigue, is distracting for workers, can impair their judgement and reasoning, and even reduce their morale. Depending on how loud the noise is, it can even be dangerous, drowning our important sounds like safety alarms and business communication and causing noise-induced hearing loss. Noise is also one of the primary causes of workplace stress. Workers can suffer high levels of anxiety as they try to perform their tasks while noise impacts on their attention, and the EPA also cites its negative effects on the cardiovascular system and long- and short-term memory. It can cause stress-related illnesses, high blood pressure, speech interference, hearing loss, sleep disruption, lost productivity, and even frustration and anger that can end in workplace disputes. This evidence should be a concern to business owners; but, luckily, there are simple solutions to the problem. Incorporating indoor plants is one of the most effective ways to buffer workplace noise, measurably reducing noise levels without making structural changes. Plants, particularly those with thick stems and leaves, are proven to be effective in reducing noise through deflection, absorption, and refraction of sound waves. One of the biggest problems in modern workplaces is the impact they have on the health of workers. Workers subject to unpleasant working environments—potentially any office space at all—are at risk of suffering from headaches, dry eyes, and respiratory problems including dry throat and coughing. Working in these conditions, and being constantly uncomfortable and unwell, has a huge impact on the stress levels of workers. Many studies have also found greater concentrations of harmful substances indoors than outdoors. Synthetic furniture, equipment, and substances in the work environment all emit volatile organic compounds (VOCs) that are a major cause of illness, including long-term and morbid illnesses like cancer. While we don’t yet fully understand the impact of our modern environments on our health, the evidence is mounting—and it’s also growing in favour of incorporating indoor plants into our workplaces. Plants are natural air filters: they are consistently being proven to reduce the toxins in indoor air and restore the balance of humidity, reducing the occurrence of respiratory tract illnesses and physical complaints among workers. By countering harmful stimuli in the work environment and supporting the health and wellbeing, indoor plants are a major contributor in reducing the stress levels of workers that impacts on their quality of life and the bottom line of the business. 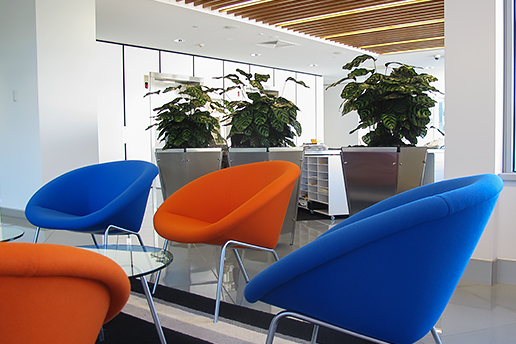 Besides reducing the impact of noxious stimuli in the workplace environment, indoor plants can also enhance creative thinking, improve concentration, and sharpen problem-solving skills in workers. A Dutch researcher found that plants can affect the health of the nervous system, which influences stress; this lead to the researcher concluding that green plants are essential to employee-friendly workplaces. Evidence investigating phenomena like biophilia—the innate tendency of human beings to seek a connection with nature and other living things—documents how green office spaces generate physiological responses, such as increased brain activity and lower stress hormones, in workers. A recent study conducted by researchers at Washington State University in the United States showed that adding plants to a windowless workplace reduced stress, as measured by systolic blood pressure readings. 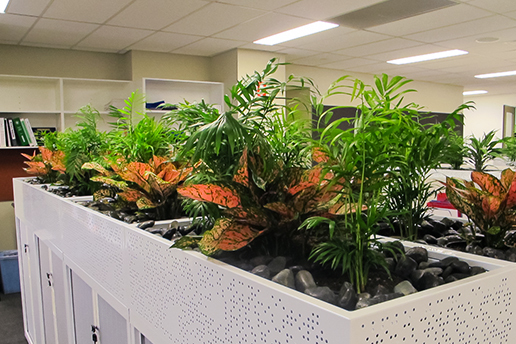 Proponents of plants in the workplace confirm that plants create a more relaxed, less stressful, environment. They explain that people who work near plants show more positive emotions and less negative ones: in essence, indoor plants help people feel calmer, more relaxed, and happier, which is proven to be conducive to better concentration, higher performance, and increased job satisfaction. Stress can cause errors, illness, reduced work quality and productivity, and increased absenteeism and turnover. It’s a vicious cycle; but forward-thinking employers can take sensible measures to interrupt it. Introducing plants into the indoor work environment is a cost-effective, low-risk and high-impact step that smart business leaders can take to reduce the negative business and personal consequences that worker stress can have for their business. It’s a simple formula: since stress increases illness and decreases effectiveness and productivity, management of stress contributes to business success—and there’s a growing body of evidence suggesting that introducing plants into an indoor work environment is an effective way to reduce worker stress. 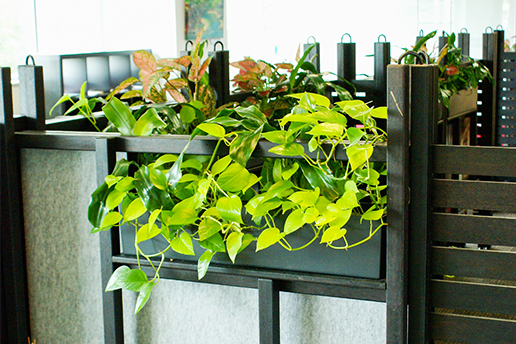 Live plants are a valuable component of any comprehensive plan to create a balanced, healthful, and productive work environment: to find out more about how you can improve your business’s bottom line and the wellbeing of your workers, contact Prestigious Plantscapes. Our skilled plant designers will be happy to help you transform your workplace into a thriving, healthful hub of productivity, and be part of moving your business into a new age of vitality.